For decades, the U.S. Supreme Court has been telling states that they can't ban abortions before a fetus can survive outside the womb on its own. But states continue to try to restrict abortion before viability. One of the most recent is Mississippi, where lawmakers are on the brink of approving a measure that would ban most abortions after 15 weeks. House Bill 1510 passed the Mississippi Senate on Tuesday and is one House vote away from the desk of a governor who is eager to sign it. The owner of Mississipi's only abortion clinic has said she'll sue if the bill goes into law — a move lawmakers not only know to expect, but seem to be encouraging, in hopes of eventually getting the nation's highest court to revisit its rulings and allow states to begin restricting abortion earlier in pregnancy. "It seems like a pretty simple bill designed to test the viability line that the Supreme Court has drawn," said David Forte, a law professor at Ohio's Cleveland State University. A number of states, including Mississippi, have already tiptoed up to the viability line with 20-week bans, although the U.S. Senate earlier this year rejected such a ban nationwide when supporters couldn't reach a 60-vote supermajority to act. An appeals court in 2015 struck down efforts in North Dakota to ban most abortions after six weeks, when a fetus develops a detectable heartbeat, and in Arkansas after 12 weeks. Abortion rights supporters are dubious that the outcome in Mississippi would be any different. "The Supreme Court has said and resaid again and again that states cannot prohibit women from obtaining abortions prior to viability, which is what a 15-week ban would do," said Hillary Schneller, staff attorney for the Center for Reproductive Rights. The New York-based group advocates for free access to abortion. 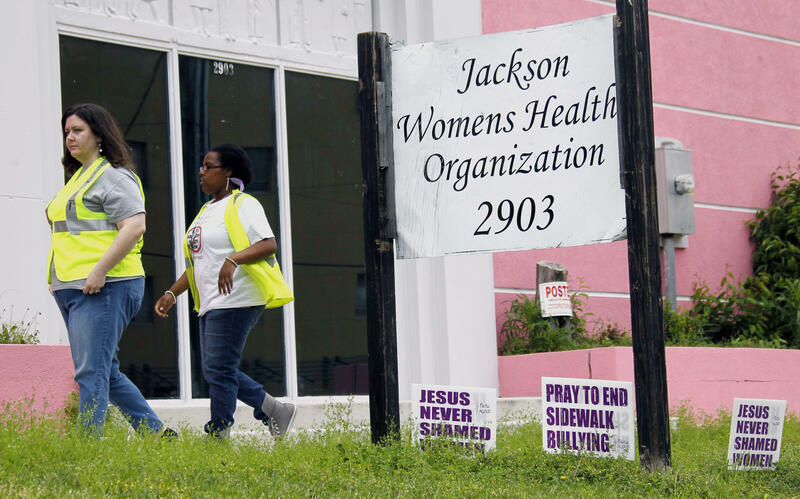 Mississippi's own 20-week ban has never been legally challenged, in part because the state's only abortion clinic, the Jackson Women's Health Organization, doesn't perform abortions that late in pregnancy. According to state Department of Health statistics, 85 percent of abortions in Mississippi took place before 12 weeks in 2016. But Diane Derzis, who owns the clinic, has said the 15-week ban would stop her from offering some abortions and she would sue. Most of Mississippi's 2,500 abortions in 2015 took place at the clinic. By comparison, Mississippi recorded 38,000 births in 2016. Proponents of the Mississippi law outside the Legislature generally regard abortion as a moral evil. But those handling the bill inside the state Capitol are arguing on narrower grounds aimed at the Supreme Court. "The reason for going to 15 weeks is that obviously, the state has several interests, including the health and well-being of mother," state Sen. Joey Fillingane said Tuesday as he shepherded the bill through the Senate. "The state has interest in the potential life of the unborn child, as well." Fillingane, a Republican from Sumrall, acknowledged that 15 weeks is "pre-viability" but argued that medical technology is allowing fetuses to survive earlier and earlier. University of Chicago Law Professor Geoffrey Stone, though, said arguing that advancing technology should move the viability window to 15 weeks is a stretch. "I'm quite sure it hasn't gone anywhere near 15 weeks," Stone said. Abortion opponents take heart from a 2007 Supreme Court case, Gonzalez v. Carhart , that allowed bans on what some call partial-birth abortions, an abortion performed relatively late in pregnancy, in which the living fetus is extracted in stages through the birth canal. The opponents believe the decision opened a window for states to restrict abortion before a fetus is viable. "We would welcome the court to clarify the extent to which states can regulate abortions, particularly with regard to maternal health," said Jameson Taylor, acting president of the Mississippi Center for Public Policy, a conservative-leaning group that helped lawmakers write Mississippi's bill. Taylor said the Alliance Defending Freedom, a Christian conservative legal advocacy group, was among those who vetted the bill's language. The Arizona-based alliance didn't respond to questions, with senior counsel Kevin Theriot saying only that the alliance "supports states' important and legitimate efforts to protect the health and safety of women and children." It's unclear if a 15-week ban will move forward elsewhere. A bill has been filed for Louisiana's upcoming legislative session. Mississippi state Rep. Andy Gipson, a Republican from Braxton, said lawmakers in Texas, Georgia, and "some midwestern states" are exploring the idea. "They're playing the short, immediate game in circuit courts where they just try and try again, and then they're also playing the long game where they're trying to change the composition of the Supreme Court," said Leslie McGorman, deputy policy director for NARAL Pro-Choice America, a national group supporting abortion rights. Stone and Forte both said they believe the chances the court will consider a major abortion case are slim as long as the current justices remain, though a case could ascend quickly on an emergency appeal of a lower court ruling. "I think the court wants to stay out of this for a while," Forte said. The likely hope of Mississippi lawmakers is that one of the justices more favorable to abortion rights, such as Anthony Kennedy or Ruth Bader Ginsburg, will have stepped down by the time the state's case reaches the Supreme Court. Kennedy, for example, has twice in the past 26 years been part of a 5-4 majority upholding abortion rights. "If Anthony Kennedy has already stepped down, this would make perfect sense," Stone said.